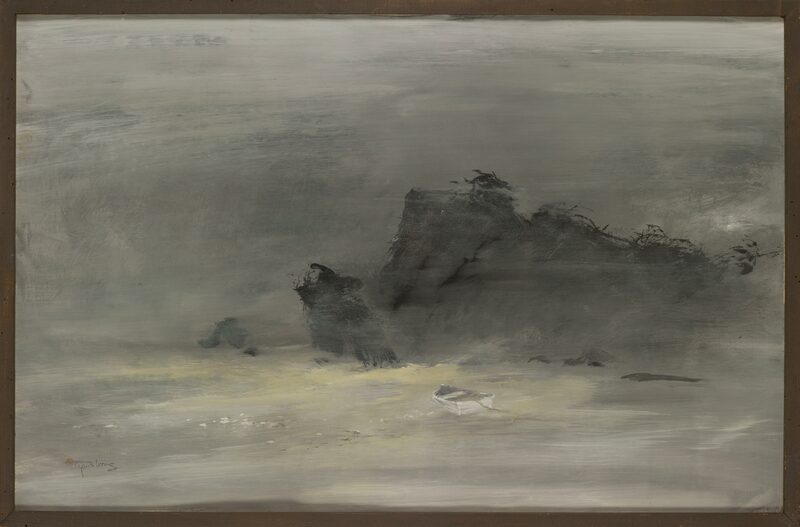 The lively brushstrokes of The Cove are evidence of Tyrus Wong's early work with calligraphy, which he was encouraged to explore as a child by his father. Wong is a Chinese American artist who was a member of Eleven Associated, an African American co-op gallery in Los Angeles, in the 1950s. He graduated from Otis Art Institute in 1930 and went on to a successful career as a scenic artist in Hollywood. He is renowned for designing all the background scenes for the Disney film Bambi, as well as working at Warner Bros. and Republic Studios. "The Cove." Now Dig This! Art in Black Los Angeles, 1960-1980 Digital Archive. Los Angeles: Hammer Museum, 2016. https://hammer.ucla.edu/now-dig-this/art/the-cove.